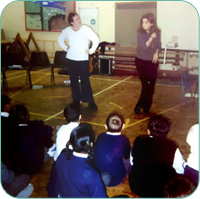 We build self-esteem, develop life skills and incorporate an interactive drugs education approach for Years 5 to 9 although we also provide tailor made sessions for other year groups. "I particularly enjoyed watching your small snippets of drama ...as well as them being pretty funny, they taught me some important lessons. Also I think your song deserved to be on Top of the Pops!" "...thank you for coming to my school and providing us with a brilliant Friday afternoon. It is probably the most enjoyable lesson I have ever had." "I have learnt a lot more about alcohol and smoking and I really enjoyed doing role play with you". "I enjoyed the whole thing because it was fun and active". "I learnt that drugs and alcohol can harm your body and that there is always another solution". "I learnt to consider others when doing something I like doing but they don't". "I enjoyed the games because they were fun and the drinks because I enjoyed mixing them". You can obtain resources from us to help you with updating your PSHE programme and drugs education policy. "Thank you very much, it focused our minds on issues relevant to making a new drugs policy". "Thank you this was a very edifying session. It also served to endorse my own feelings towards children and the pressures they undergo today". "Lots of interesting ideas for role play and PSHE Sessions". "Very good, positive learning experience". "Extremely pleasant and well presented by the Arcade team worker. They were very aware of young people and their feelings". "I am now using some of Arcade's methods for teaching".